OK! 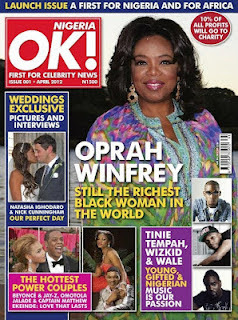 is a British weekly magazine specializing in celebrity news. Originally launched as a monthly, its first issue was published in April 1993. In September 2004, OK! publishers Northern and Shell launched in Australia as a monthly title – the magazine went weekly in October 2006. In 2005, a US version was launched, followed by an Indian edition in May 2006, a Spanish-language version in Mexico in 2006, a Bulgarian-language version in 2007 and a Spanish edition in 2008. OK! is the world’s biggest celebrity lifestyle magazine, with more than 30 million readers worldwide, and now appears in 20 countries (Australia, Austria, Azerbaijan, Bulgaria, China, Germany, Greece, India, Ireland, Malaysia, Mexico, Middle East, the Philippines, Russia, Spain, Switzerland, Thailand, Turkey, the UK, the US, Venezuela and Vietnam). And now OK! has added Nigeria to their famous list!